... I didn't manage to find those willing to do a commentator's work, so I will present the most sympathetic games of June myself. However, the second part of the statement above requires an important specification. Three ultimate favorites of the jury – Dreev-Minasian, Karjakin-Radjabov and Riazantsev-Rublevsky have already been annotated by the winners: Dreev and Rublevsky in '64' and Karjakin on ChessPro. The remaining games of that generally dull in a creative sense month are not so bright. Therefore, I'll broadcast them businesslike and without aspiration. As the 10th place in the list is shared between two games, and commentator's labor regulations do not allow taking more than 7 games apiece (don't remember where did I get it though), the wisest solution is to limit myself to six games that were distributed between 4th and 9th spots. Having spared the most delicious pieces till the end, let us start with number 9. Tiger Hillarp Persson is a player with memorable name and bright style. In this game he eagerly went into the opponent's trap, and after exchanging his queen to minor pieces inexorably led his army to the enemy king. 1.e4 g6 2.d4 Ґg7 3.c3 d6 4.¤f3 ¤f6 5.Ґd3 0-0 6.0-0 ¤c6 7.¦e1 e5 8.h3 h6. It is not a blind copying of the opponent's actions. Well, whatisit? It'sasightedcopying. Black covers the g5 square, because in case of immediate 8...¤h5 and White's reply 9.Ґg5 it could be annoying to choose a move. 9.¤a3. Taking care of d4. Anand himself played this way against Tkachiev at the world championship in Moscow (2001), thus I will not talk about the alternatives. 9...¤h5. 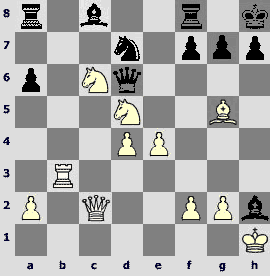 Black could keep the knight in the center – 9...¤d7, and to meet 10.Ґb5 with 10...¤e7. Other options are 9...Ґd7 and 9...¦e8. 10.¤c2. 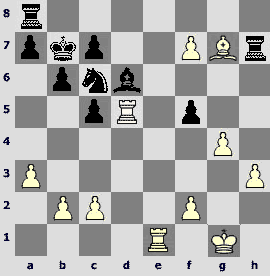 Smirin defeated Bologan in 1992 with 10.Ґe3. For the unknown reason nobody has followed his footsteps ever since. 10...a6. A game Certic-Bogdanovski (Belgrade 1994) resembles this encounter. They played 10...Јf6 11.Ґe3 ¤f4 12.Ґf1 g5 13.¤h2 Јg6 14.dxe5 dxe5 15.Ґc5 ¦d8 16.Јf3, and Black has a good game. 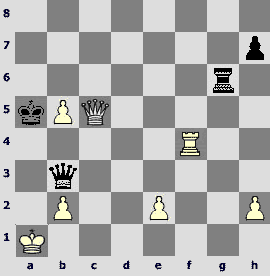 More enterprising for White is 11.b4 ¤f4 12.Ґxf4 Јxf4 13.¤e3. The opponents of Georgian player Bakhtadze fell into the same trap twice: 13...¤e7?! 14.¤f5! ¤xf5 (14...gxf5?? 15.g3) 15.exf5 h5 16.g3 Јh6. Black's position is still not so bad, and he rescued the queen without obvious concessions, but one should play more accurately (see in the next note). 11.a4 Јf6 12.a5. 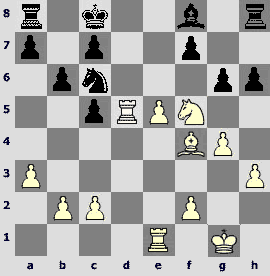 Siebrecht against Brodsky (Hamburg 2001) after 12.Ґe3 ¤f4 13.Ґxf4 Јxf4 14.¤e3 retreated 14...Јf6. And this is correct, but Black's unnecessary knight maneuver later led him into a worse position: 15.dxe5 dxe5 16.Јe2 ¤b8 17.¦ad1 ¤d7 18.a5 c6 19.¤c4. I congratulate the reader on finishing the theoretical part. 12...¤f4 13.Ґf1 g5 14.d5 ¤e7 15.¤e3 Јg6. All these actions are fairly straightforward (of course, one could argue with White's decision to lock the center by 14.d5). Black has prepared to play f7-f5, and one should thank Gausel for overreacting to it. 16.g4?! One could allow Black to proceed with his idea, protecting the e4 pawn with something like 16.¦a4 and meeting Black's counterplay with the pressure on c7. The text move is aimed at no less than killing a whole opponent's setup. 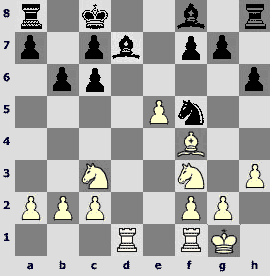 Black has the only way to diminish a solemnity of raising the knight on f5. 16...Јxe4! 17.¤f5 Ґxf5 18.¦xe4 Ґxe4 19.c4. Giving up a queen was essentially forced, but the next move of Tiger deserves an utmost praise. It displays a free creative will of the Swedish grandmaster. In fact it was the following sacrifice of a modest pawn (d6) that predetermined the outcome of the game. One recalls a saying: 'It is not beer that ruins a man, but water'. 19...c6! 20.dxc6 Ґxc6 21.Јxd6. IthinktheNorwegiansignedthescoresheetwiththismove. Now each Black's unit clearly understands where to go, while White's forces observe an inappropriate activity of their queen from rear and with fear. After 21.Ґxf4!? exf4 22.¤d4 or 21...gxf4 22.b4 position remained unclear. 21...¤eg6 22.¤e1 ¦ad8 23.Јa3. Protectingtherook. In case of 23.Јb4 ¦d1 White's situation is even sadder. 23...e4! Noweverythingflourishes! Dark-squared bishop enters the play, and knight goes to d3 and f3 via e5. 24.Ґe3 ¤e5 25.Јb3 ¦d7 26.¦d1 ¦fd8 27.¦xd7 ¦xd7 28.Ґg2 ¤xg2 29.ўxg2 ¤d3 30.¤c2. I do not see how White can reasonably change any thing. Tiger begins a decisive regrouping. 30...¤f4+ 31.ўh2. 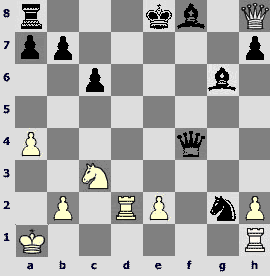 The last attempt to revive the pieces was 31.Ґxf4 gxf4 32.¤b4 (fruitless is 32.ўf1 ¦d1+ 33.ўe2 ¦b1). Black responds to it by 32...e3+. On 33.ўf1 the winning variation looks like 33...¦d2 34.¤xc6 ¦xf2+ 35.ўg1 bxc6 36.Јb8+ Ґf8 37.Јe5 ¦d2 38.g5 ¦d6!? 39.gxh6 ¦e6 40.h7+ ўxh7 41.Јxf4 ўg8, and White can't handle Black's e-pawn. Andif33.¤xc6 e2 34.Јb4, then one shouldn't rush. After 34...¦d1 35.¤e7+ ўh7 36.Јc5 White finally creates real threats that guarantee a draw. For example, dubious is 36...Ґxb2 37.Јh5 ўg7 (37...e1¤+ 38.ўf1) 38.¤f5+ ўf8 39.¤xh6, and Black will run away from checks, guessing whether or not he loses his passed pride. On 36...Ґf6 White also has 37.Јh5! A draw by perpetual appears after 36...e1¤+ 37.ўh2 Ґe5!? 38.¤f5 ¤f3+ 39.ўg2 ¤e1+. However, 34...bxc6 35.ўf3 Ґf8 36.Јe1 ¦e7 clarifies the picture. 31...¦d3 32.Јb6 Ґe5 33.Јa7. This mysterious dive into a blue is merely a defense against a discovered check. Losingis 33.Јc5 Ґb8. 35.h4 ¦g1+ 36.ўh3 h5 37.f3. On 37.gxh5 more precise is 37...g4#: once I read in domestically produced periodicals about, I think, Buryatian chess, that delivering mate with a pawn shows a greatest degree of mastery. 37...Ґd7# wins legally as well. One can only postpone it by 37.Јa8+ ўg7 38.Јc8. 37...¦h1+ 38.ўg2 exf3+! Very nice – 39.ўf2 Ґg3# or 39.ўxh1 f2#! White resigns. We go on with a Scandinavian saga. Carlsen the Kid and Nielsen the Giant are friends, but they do not give each other an easy life in official events. Their encounter from the Bundesliga (won by the elder one) was among the best games in March. Magnus took revenge at the European championship. 1.e4 e5 2.¤f3 ¤c6 3.Ґb5 ¤f6 4.0-0 ¤xe4 5.d4 ¤d6 6.Ґxc6 dxc6 7.dxe5 ¤f5 8.Јxd8+ ўxd8 9.¤c3 h6 10.h3 Ґd7 11.Ґf4. A refusal to fianchetto the bishop will be in fashion for some time, because of very convincing win of Short against Sokolov in Wijk aan Zee. 11...ўc8 12.¦ad1 b6. That game developed 12...Ґb4 13.¤e4 Ґe6 14.c3 (a mess after 14.g4 Ґd5 15.gxf5 Ґxe4 16.¤d4 Ґd5 favors Black, Nijboer – Narciso Dublan, Mondaris 2000) 14...Ґe7 15.b3 b6 16.g4 ¤h4 17.¤xh4 Ґxh4 18.Ґg3 Ґe7 19.f4 h5 20.f5 Ґd5 21.¦d4 hxg4 22.hxg4, and Nigel got if not everything then just about everything of what White needs in the Berlin. 13.a3. 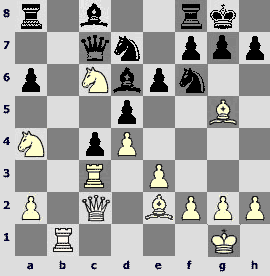 Preventing a bishop's thrust, which led to a peaceful negotiation in the game Velikhanly-Risouk (Abu-Dhabi 2002):13.¦d3 Ґb4 14.a3 Ґxc3 15.¦xc3 c5 16.¦d1 Ґc6 17.¦cd3 ¦e8 18.¤e1 ¤d4 19.Ґh2 Ґb5 20.¦3d2 ўb7 21.f4 h5. Although Topalov had done pretty well without Bb4 in his rapid game with Anand in Monaco, obtaining a good play by 13...Ґe6 14.¦fd1 ўb7 15.b3 g5 16.Ґc1 c5 17.¤d5 ¤e7 18.¤xe7 Ґxe7 19.c4 ¦ag8. In the end of that game Veselin got mated, as you remember, but that happened just due to the specific game format. 13...Ґe6. Black could also fool the opponent and himself by 13...¤e7. 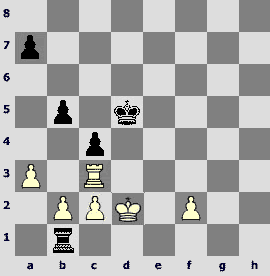 After the text, the game becomes more concrete: White attacks and creates threats, Black defends. 14.g4 ¤e7 15.¤d4 Ґc4 16.¦fe1 c5 (aimed against е5-е6) 17.¤f5 ¤c6. After 17...Ґe6 18.¤xe7+ Ґxe7 19.Ґg3 the situation begins to resemble the game Short – Sokolov, which can't comfort Black. 18.¤d5 Ґxd5 19.¦xd5 g6. After 19...¤d8 20.¦ed1 ¤e6 21.Ґe3 White stands better. Peter Heine applies for the d4-square. 20.e6! Sudden, good-looking and strong. 20...gxf5. It is clear that 20...fxe6 21.¦xe6 gxf5 22.¦xc6 is grotty. 21.exf7 Ґd6?! 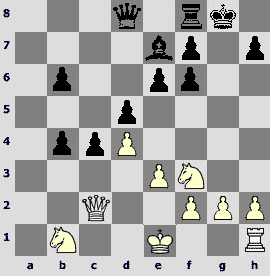 It is risky for Black to allow the rooks penetrating into his own camp. 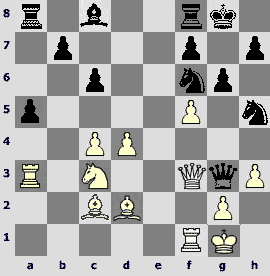 The play is all White's after 21...ўb7 22.¦d7 ¦c8 23.¦e8 ¤d4 24.c3 ¤f3+ 25.ўg2 fxg4 26.hxg4 ¤h4+ 27.ўg3 ¤g6 28.¦xc8 ўxc8 29.¦xc7+ ўb8 30.¦d7+ ¤xf4 31.ўxf4 or 21...Ґg7 22.¦e8+ ўb7 23.¦d7 ¤d4 24.¦xc7+ ўa6 25.¦ce7. However, I do not see the reason to refuse 21...¤e7. After 22.¦de5 (other moves are much worse) Black can either call for a move repetition by 22...ўd7, or go to a sharp position that arises in case of 22...¤g6 23.¦e8+ (23.¦xf5 ¤xf4 24.¦xf4 ўd7) 23...ўb7 24.Ґxc7 fxg4 25.¦1e6 ¤h4. It seems Black does not risk losing it. 22.Ґxh6! Mass exchanges after 22.¦e8+ ўd7 23.¦xh8 ¦xh8 24.Ґxh6 ўe6 25.¦xd6+ cxd6 26.f8Ј ¦xf8 27.Ґxf8 fxg4 28.hxg4 ¤e5 lead to material and moral leveling of the game. 22...ўb7? Of course, Nielsen is aware of a principle of king centralization in the endgame. He just underestimates White's combinational resources. After the correct 22...ўd7 black bishop becomes pinned. 23.Ґg7 ¤d4 24.Ґxh8 ¦xh8 25.g5! (more coal into a fire-box; too indifferent is 25.¦e8 ¦xe8 26.fxe8Ј+ ўxe8 27.c3 ¤f3+ 28.ўg2 fxg4 29.hxg4 ¤e5) 25...¤f3+ 26.ўf1 ¤xg5 (26...¤xe1? 27.g6, and the pawns promote) 27.¦xf5, still possessing the initiative: 27...¤xh3 28.¦e4 or 27...¤e6 28.¦f6 ¤d8 29.h4. 23.Ґg7 ¦h7. This time the Dane asks his young fellow to present him the f7-pawn. He is again denied, and the outburst of emotion on board follows. 24.¦xd6! (24.¦e8 ¦xg7 25.¦xa8 ¦xf7!) 24...¦xg7 (24...cxd6? 25.¦e8) 25.¦xc6! fxg4. 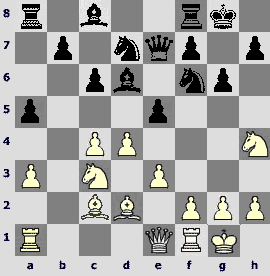 After 25...ўxc6 26.¦e8 ¦xf7 27.¦xa8 fxg4 28.hxg4 ¦f4 29.¦g8 White keeps two connected passers. 26.¦xc7+! The situation calls for some inspired words about the heroic rook, however, for some reason I can only compare it with a fat lady who is pushing everyone near her in a communal bus. Weaker is 26.hxg4 ¦xg4+ 27.ўf1 ¦f4! 26...ўxc7 27.¦e7+ ўc6 28.f8Ј ¦xf8 29.¦xg7 gxh3 30.¦h7. Look how everything has worked out! Black can't keep the material balance. 30...¦d8 (30...¦f3 31.ўf1, then ўe2, and the rook has to leave the 3rd rank) 31.¦xh3 ¦d1+ 32.ўg2 ¦c1 33.¦c3 (no charity here as well) 33...b5 34.ўf3 ўd5. After 34...a5 35.ўe4 b4 36.axb4 axb4 37.¦c4 the rook is safe, and white king is correctly positioned in front of the passed pawn. 37.¦h3! Yet another little trick –37...¦xb2 38.ўc1 ¦a2 39.ўb1. 37...¦f1 38.¦h5+ ўd4? This mistake makes it easier for White. Necessary was 38...ўc6 39.¦f5, and one has to sweat to win a second pawn. 39.ўe2 ¦c1 40.ўd2 ¦f1 41.ўe2 ¦c1 42.c3+ ўe4 43.f3+ ўf4 44.¦xb5 ¦c2+ 45.ўd1 ¦h2 46.ўc1 ўxf3 47.¦c5 ¦h4 48.ўb1 ўe3 49.¦c7. Black resigns. The recent achievements of Levon Aronian speak for themselves. His ironic annotations that contain a decent amount of self-criticizing can misguide a reader, making him to believe that Levon wins only because his opponents commit heavier blunders than the player himself. However, it is easy to guess that it is a complexity and difficulty of the tasks imposed by Levon that force them to err. If my eyes and "Fritz" didn't fool me, Black could make a draw in the following game just a couple of moves before a conclusion. It doesn't diminish the value of the game, though. Both players were up to the par for a long time (although, I repeat, if Levon annotated the game himself, he would explain that both players had a very rough grasp of the course of events). This position is familiar to me from my work on Dachess website. The idea of Ivan Sokolov, which brought him a fine victory over Sergey Ivanov in Goeteborg-2004, impressed experts and joined the top 30 games of the year. I shamelessly use Sergey's annotations to the opening phase. 10...a5. Tactical justification of placing the queen on е1 is revealed in a thematic variation 10...e5 11.dxe5 ¤xe5 12.¤xe5 Јxe5 13.¤xd5! 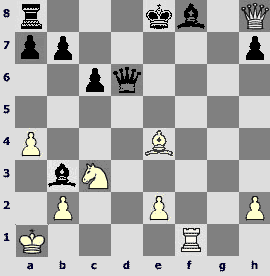 ¤g4 14.¤f4 Ґxd2 15.Јxd2 g5 16.h3 gxf4 17.exf4, and White wins a pawn. In the game Black played 10...Ґd6 11.c5 Ґc7 12.e4 e5 13.exd5 ¤xd5 14.Јe4 ¤5f6 15.Јh4, and here he should have continued with 15...Јd8! with some prospects to equalize. One can execute a freeing break е6-е5 after exchanging on c4 – 10...dxc4 11.bxc4 e5. Ivanov gives here 12.Ґf5 with initiative. 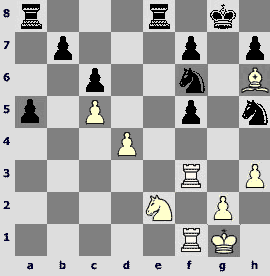 In Warsaw this position was tested in Sargissian-Gagunashvili, and White played 12.Ґc2. After 12...¦e8 13.c5 exd4 14.exd4 b6 15.Јxe7 ¦xe7 16.cxb6 ¤xb6 17.¦ab1 a5 18.a3 Ґxc3 19.Ґxc3 ¤c4, the simplifications led to a draw. This exhausts the present theory of the variation. 11.Ґc2. 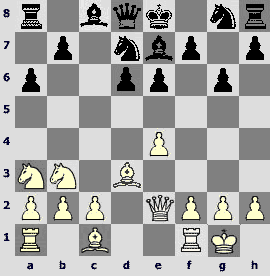 Removing the bishop away from a possible attack е5-е4. Sergey also considered 11.e4 and 11.a3 Ґxa3 12.e4. 11...dxc4 12.bxc4 e5 13.a3. Kornev displayed an uncompromisingness and took the bite only when it gave him a real profit. Immediate 13...Ґxa3 is well met by 14.¤xe5 (14.dxe5 ¤g4) 14...¤xe5 15.dxe5 ¤d7 16.f4, and material in this crooked position is balanced. 13...Ґd6 14.¤h4. Of course, there are many options here. Probably interesting is 14.Јb1, but we'll have enough of entertainment in the game, so let's not dig into it. 14...g6. A fearless electronic counter does not hesitate to play 14...exd4 15.¤f5 Јe5 16.f4 Јc5 17.exd4 Јxc4 18.Јg3 (18.¤xd6 Јxd4+) 18...¤h5 (not 18...g6 19.Ґd3) 19.Јf3 g6 20.Ґd3 Јe6 21.¦ae1 Јf6. But it is scary for a human to run in a minefield. Moreover, even if Black reaches this position without casualties, after 21.d5 White in my opinion has a good initiative. 15.f4. Maybe Levon thought that the opponent decided never to capture on а3, so he did not include 15.c5 Ґc7 before playing f2-f4. 15...exd4 16.exd4 Ґxa3! 17.Јg3 ¤h5. Playing Black, I would try to cover up the traces at once by 17...Ґb4. «Yousaytherewasapawn? Whichpawn? No, I've got a bishop on b4, I won't put it on b4 if there was a pawn on a3!» But Alexey is self-confident. After 17...Ґb4 White would probably push the f-pawn further – 18.f5 or 18.¤f5 Јd8 19.¤h6+ ўh8 20.f5. 18.Јf2 ¤df6 19.¦fe1 Јd8! The bishop that stole a pawn is exchanged to the knight standing on another side of the board. One could also defend the queen by 19...Ґe6. In this case 20.f5? is strongly met by 20...¤g4, 20.h3 Ґb2 21.f5?! is dubious: 21...Ґxa1 22.¦xa1 Ґxc4 23.g4 and 20.h3 Ґb2 21.¦ab1 is not very convincing: 21...Ґxc3 22.Ґxc3 Јc7 23.d5 cxd5 24.f5. Maybe a cautious 21.¦a4!? suggested by computer is indeed the most measured solution. 20.¦xa3 ¤g4 21.Јf3 Јxh4. Obtaining a lot of pawns for a piece is hardly a better option: 21...Јxd4+ 22.Ґe3 ¦e8 23.Ґxd4 ¦xe1+ 24.Јf1 ¦xf1+ 25.ўxf1 Ґe6 or 22...¤xe3 23.Јxe3 Јxe3+ 24.¦xe3 ¤xf4 25.c5. 22.h3 ¤gf6. 22...¤h6 deserves attention if only for the originality of the resulting position. 23.¦f1. 23.¦e5 looks gorgeous, but after 23...¦e8 the situation is still complicated. 23...Јg3. Another interesting opportunity – 23...Ґg4 24.Јf2 (bad is 24.hxg4 ¤g3) 24...Јxf2+ 25.ўxf2 Ґe6. 24...Јd6. In case of 24...Ґxf5 25.Ґxf5 gxf5 26.Јxf5 it turns out that the pair f6-h5, left without a pawn support, became fairly vulnerable, e.g. 26...Јd6 27.c5! Јxd4+ 28.¦f2 ¦fe8 29.g4 (probably better than 29.¦a4 Јe5 30.g4 ¦ad8) 29...¦e5 30.Јf3 Јxc5 31.gxh5 ¦e6 32.¦b3. 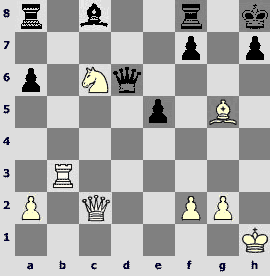 Kornev's move allows White to protect the a3 rook without sacrifices. 25.¤e2 Ґxf5 26.Ґxf5 gxf5 27.c5 Јd5 28.Ґh6!? Harmless for Black is 28.Јxf5 ¦fe8 29.Јxd5 ¤xd5 30.¤g3 ¤xg3 (or 30...¤g7) 31.¦xg3+ ўf8 32.Ґh6+ ўe7 33.¦g7 ўe6 followed by ¦e7. 28...Јxf3. On 28...¦fe8 White could play 29.¤g3, and in case of the greedy 29...Јxd4+ 30.ўh1 Black will get lost with his knights: 30...Јh4 (or 30...Јc4 31.¤xf5) 31.¤xf5 Јe4 32.g4. 30.¤g3 ¦e6? Right, it is time to get rid of ballast. After 30...f4! 31.Ґxf4 ¤xf4 32.¦xf4 ¤d5 33.¦xf7 ¦e7 or 33...¦f8 Blackdoesnotrisklosing. 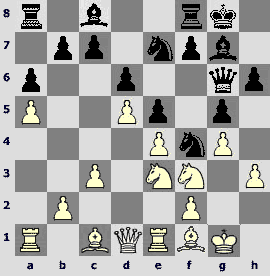 But, of course, it was difficult to predict that after the opponent's response black pieces can not be entangled. 31.¦xf5! ¤g4!? Black fork 31...¤xg3 will be crumbled to dust by white mill – 32.¦g5+ winning both knights. Resourceful defense of the opponent forces Aronian to find the only solutions. 32.¦g5+! Insipid is 32.hxg4 ¤xg3 33.¦g5+ ¦g6 or 32.¤xh5 ¤xh6. 33.¤f5! Once again none of the captures worked, but this nice thrust that created more threats ends the game. 33...¦xg5. If 33...¤gf6, then 34.¤e7+ ўh8 35.¤xg6+ (also ok is 35.¦xg6 hxg6 36.g4) 35...hxg6 36.g4 ўh7 37.gxh5 ўxh6 38.¦g2, and the f7 pawn falls. 34.¤e7+! Precision can not be excessive! In case of 34.Ґxg5 ¤gf6 35.¤e7+ ўg7 36.g4 ¤e4! Black could survive the storm without losses. 34...ўh8 35.Ґxg5. The knight g4 is trapped! 35...¤g3 36.hxg4 h6. 36...¤xf1 37.Ґf6#. 37.Ґf6+ ўh7 38.¦e1. Black resigns. Like the first part of the review, the second part begins with a game, in which Black sacrifices a queen. Its content can be described in a few words: Vadim Milov played well, and Pavel Smirnov, apparently, did not discover the opponent's intentions twice. 1.e4 c5 2.¤f3 e6 3.d4 cxd4 4.¤xd4 a6 5.Ґd3 Ґc5 6.¤b3 Ґe7 7.Јg4 g6 8.Јe2 d6 9.0-0 ¤d7 10.¤a3. 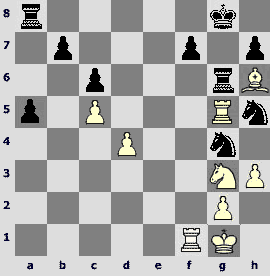 A move brought into a practice by Motylev in the Russian Superfinal 2004 (the idea suggested by Motylev's second, IM Vokarev – Ed.) 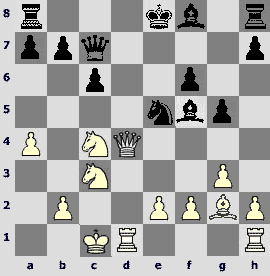 In that game Motylev defeated an impenetrable Epishin. Old moves are 10.¤c3 и 10.c4. 10...h5. In the original game Epishin responded with 10...ўf8, and after 11.¤c4 ўg7 12.Ґd2 ¤gf6 13.Ґc3 ¦e8 14.f4 d5 15.¤e3 dxe4 16.Ґxe4 e5 17.Ґa5 b6 18.Ґxa8 bxa5 White won an exchange and converted it into a full point after a prolonged struggle. 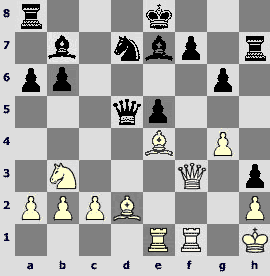 Kveinis against Landa (Belgium 2005) selected 10...¤e5 11.¤c4 ¤f6 12.Ґd2 ¤xc4 13.Ґxc4 0-0 14.¦fd1 Јc7 15.Ґd3 d5 16.exd5 ¤xd5. A final word has been said in Dortmund: 10...Јc7 11.ўh1 h5 12.¤c4 ¤gf6 13.a4 b6 14.a5 b5 15.¤b6 ¦b8 16.Ґe3 ¤g4 17.Ґd4 Ґf6 18.¤xd7 Ґxd7 19.f3 Ґxd4 20.¤xd4 ¤f6 21.f4, White having a more pleasant play, Naiditsch – van Wely. 11.f4 Јc7 12.Ґd2 ¤gf6 13.ўh1 h4. f4 and ўh1 is not a good match. 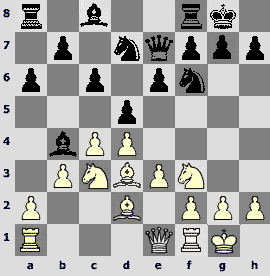 White can't prevent the h4-h3 with h2-h3, because then the weakness of g3 tells, therefore he has to move the g-pawn. So what is the purpose of placing his king on the long diagonal? Actually, this motif played a key role in White's defeat in this game. Maybe it's time to talk about fate: Pavel had many opportunities to fix this weakness, but he only worsened it. 14.¦ae1 e5 15.¤c4 h3 16.g3 b6 17.Јf3. Objectively this move does not deserve a question mark, but White lays the largest brick in a foundation of his fiasco. He should have tuned to another diagonal – 17.Ґc3. 17...Ґb7 18.fxe5 dxe5 19.g4 ¦h7 20.¤e3. 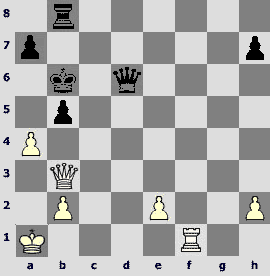 Position remained complex in case of 20.g5 ¤h5 21.Јf2. 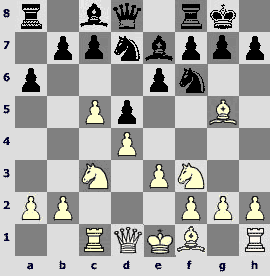 And even 21.Јxh3 can't be punished, although the move is useless. However, White is already on a wrong track. 23...Јxe4! 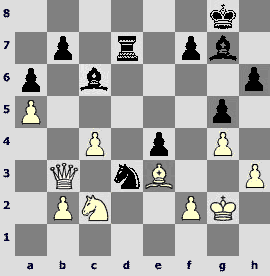 White probably considered only 23...¤f6 24.Ґxd5 Ґxd5 25.Јxd5 ¤xd5 26.¦xe5 with the initiative in the endgame. 24.¦xe4 ¤f6 25.¦fe1? No doubt that Pavel missed a tactical shot. Otherwise he would have played 25.ўg1 ¤xe4 26.Ґe3 ¦c8 27.c3 (27.¤d2 f5) 27...Ґc6. Black is better, but there is a lot of play ahead. 26...f5! 27.gxf5 ¦h4. Where on earth did it come from? It stood quietly, taking care of the f7-pawn, and suddenly it shows such an aggression. And – blame White's ill luck – there are no reinforcements ready to support the rook. 28.ўg1 Ґxe4 29.Јg3 Ґxf5 30.Јxe5 ¦d8. Despite a material equity, White's situation is completely hopeless. Vadim confidently converts his advantage. 31.ўf1 ¦e4 32.Јg7 Ґh4 33.Јh8+ ўf7 34.Јh7+ ўe6 35.Јh6 ¦d7! 36.c3 ¦f7 37.Ґe3 ўd7 (also possible is immediate 37...¦g4) 38.¤d2 ¦g4 39.ўe2 ¦e7 (39...Ґc2! could have been a coupe de grace) 40.ўf3 Ґf6 41.Јf8 Ґe5 42.Јa8 Ґxh2 43.Јd5+ Ґd6 44.c4 ¦g3+ 45.ўf2 ¦gxe3 46.Јb7+ ўd8 47.Јd5 ўc7. White resigns. Baadur "the Killer of Long Variations" Jobava added yet another prepared crushing victory to his resume. The following game is discussed in detail by Vladimir Belov and Artur Gabrielian ("Chess Week", N24), but one could enjoy it once again. Besides, I've got something to add. 14...Ґe6. Last year in Istanbul Kulaots tried 14...¤xc4 against the Georgian grandmaster, but after 15.Јxc4 Ґd6 16.Ґe4 Ґh3 17.Јd3 Ґe5 18.Ґf5 Ґxf5 19.Јxf5 he did not manage to defend. Russian national team (or, more personally, Alexander Grischuk) took a severe blow at the Olympiad in Calvia. Grischuk played 14...Ґe7 15.¤e3 Ґe6 16.Јe4 Ґb3 17.¦d2 0-0 18.h4 gxh4, and the game did not last long: 19.Јxh4 ¦f7 20.¤f5 ўh8 21.Ґe4 ¦af8 22.f4 ¤c4 23.¤g7 ¦xg7 24.Ґxh7 f5 25.Јh5 Ґh4 26.Ґxf5+, Black resigns. Hole preferred 18...Ґc5 against Elsness in the Norwegian championship this year, and made a draw, but Magnus does not fully trust his compatriot and favors the choice of the author of this variation. 20.ўa1!? Here comes the result of a research! In Gelfand-Morozevich (Monaco 2005) white king retreated to another square – 20.ўa2 (which is logical in view of a coming check from c2), and after 20...¤e3 21.Ґh3 ¤xd1 22.¦xd1 ¦d8 23.¦f1 Јc4+ 24.ўa1 Јc5 a complex position emerged. The game ended a draw in yet forty more moves. However, after some homework one can play without prejudices. 20...¤e3 21.¦d2 ¤c2+? There is no alternative to 21...¤xg2 – now it is an established fact. However, it is unclear what the exact evaluation of this position is. The annotator does not have a strong motivation to dig into it, so we should wait until practical players say their word. What does White hope for? 22.e3 looks tempting for a human's eye, however, it is easy to see that after 22...¤xe3 23.¦e1 Black has at least 23...¦d8 24.¦xe3+ (24.¦de2 ¦d3) 24...Јxe3 25.¦xd8+ ўxd8 26.Јxf8+ ўc7, and White has no winning chances. Therefore, 22.¦d4! (losing a bishop and a tempo!) Any move other than 22...Јf5 leads to a better position for White after 23.¤e4, according to a computer evaluation, for example, 22...Јe3 23.¤e4! Ґxe4 24.Јe5+. So let' move to f5, one has to respect hardware. «CW» authorsstudy 23.¦g1 and 23.h4. I think, in both cases Black should respond 23...¦d8. It is quite possible that these are the most promising continuations for White, but I want to analyze more human moves. If we know that 23.¤e4 rules out any other retreats of black queen, why don't we test it here as well? 1) 23...ўe7. 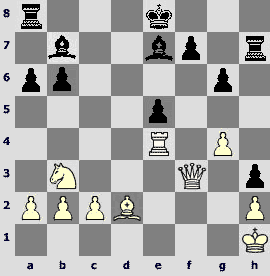 Following 24.¦hd1 ¤e3 25.¦d7+ White wins in a spectacular fashion in case of 25...Јxd7? 26.Јe5+ ўd8 (26...Јe6 27.Јc7+ ўe8 28.¤f6+! Јxf6 29.Јd7#) 27.¦xd7+ ўxd7 28.¤f6+, but after 25...ўe6 risky is 26.Јg8+ ўe5 27.Јh8+ ўf4, and Black plays for a win, while 26.¦1d6+ Ґxd6 27.¦xd6+ ўe7 28.Јxa8 ¤c2+ leads to a perpetual. 2) 23...ўf7 24.¤g3 (24.¤d6+ leads to complications 24...Ґxd6 25.Јxa8 Ґe7 26.Јxb7 ¤e3 27.Јb3+ Јe6) 24...Јe6 25.¦f1+ ўe7 26.e4. White has coordinated his pieces and is ready to deliver decisive blows, but here comes 26...¤e3 27.¤f5+ Ґxf5 28.exf5 ¤c2+ 29.ўb1 ¤a3+!, and a draw. Another sensible attempt is23.¦hd1. On 23...¤e3 there is a long and forced line 24.¦e4+ Јxe4 25.¤xe4 ¤xd1 26.¤f6+ ўf7 27.¤xh7 Ґxh7 28.Јxh7+ Ґg7 29.Јf5+ ўe7 30.Јe4+ ўf7 31.Јc4+ ўf8 32.Јb4+ ўe8 33.Јxb7 Ґxb2+ 34.ўa2 ¦d8 35.Јxa7, leading to a fruitful for White ending, but one could play 23...Јe6 24.¦d6 Јe7, and nothing is clear. 22.¦xc2 Ґxc2 23.¦f1 Јd6. Vladimir Barsky in "Chess Today" shows a more stubborn 23...Јb4 24.Јe5+ Ґe7 (bad is 24...Јe7 25.¦xf8+ ўxf8 26.Јh8+) 25.e4, but it is only about stubbornness; one can't realistically hope to survive with such a king in a position with even material. 25.¤b5! This resource was taken into the account by Baadur when playing 1.d4. The knight sac helps to approach the king. 29.Јg7+! 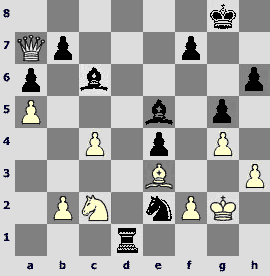 ...while in the rook ending –29.Јxd6+ ўxd6 30.Ґxb5 ¦g8 Black has a counterplay. 29...ўxc6 30.Јc3+ ўb6. 30...Ґc4 pins not only the bishop, but also the queen – 31.¦f6. The variations in this phase of the game are simple, but quite nice. 31.Јxb3. In this heavy pieces endgame White has an extra pawn, and Black has a bad king. 31...ўa5 32.Јc3+ Јb4 (32...ўxa4 33.b3+ ўa3 34.¦b1 mates) 33.Јc7+ ¦b6 34.Јxa7+ ¦a6 35.Јc7+ ¦b6. In the event of 35...ўxa4 36.¦f3! Black can't avoid a pawn endgame – 36...Јe1+ 37.ўa2 ўb4+ 38.¦a3 ¦a4 (38...¦xa3+ 39.bxa3+ ўa4 40.Јa7+) 39.Јc3+ Јxc3 40.bxc3+ ўc4 41.¦xa4+ bxa4 42.e4. A finish is up to the whole game: 39...Јxb5 40.¦a4+! ўxa4 41.Јa3#. Blackresignedintime. Nobody was defeated in a game that concludes our monthly review. 8...b6!? Unlike Jobava, Ferenz Berkes surprises his opponent early. More impressively, it happens in a position known to humans for decades. The best minds preferred careful 8...c6, and after 9.Ґd3 decided whether to play 9...b6 or 9...e5. The young Hungarian fears nothing. Strictly speaking, Sasikiran should not have been surprised, because Berkes had already employed this move, and the games are freely accessible in a database. However, looking at what the Indian was doing in this game, it was a surprise for him indeed. 19.¤bd2 b5 20.0-0 b3. White finally got scared looking at the pawn mass, he returned the piece – 21.¤xb3 cxb3 22.Јxb3 – and later lost the game. Surely, White's play can and should be improved, but it is clear that a player who doesn't hesitate to part with a piece on the 10th move of a classical opening will not be shaken by a minor improvement. 9...c5. That's why I believe Sasikiran was hit by surprise. In case of 8...c6 9.Ґd3 b6 10.cxb6 Black executes this advance with a loss of tempo. Be Krishnan prepared for this scheme, he would react in a more sensible way. 10.Ґe2 Јxb6 11.0-0?! Without this unnecessary sacrifice the game would have been much less exciting. 11...Јxb2 12.¤a4. 12.dxc5 ¤xc5 13.Ґxf6 Ґxf6 14.¤xd5 exd5 15.¦xc5 Јxa2 16.¦xd5 leads to a position, for which a true Gruenfeld devotee would give his last shirt. 12...Јa3. If 12...Јxa2?, then 13.¦a1, and black queen is caught, however chess is not checkers, but gymnastics of mind, wonderful alloy of science, sport and art, beloved game of millions – in other words, capturing is not necessary. 13.¦c3. After 13.dxc5 ¤xc5 14.¤xc5 Ґxc5 15.Ґxf6 gxf6 a small disorder on Black's kingside does not fully compensate for a sacrificed pawn. 13...Јb4. 13...Јxa2? looksstupid again. The queen is not caught, but after 14.dxc5 it stands badly, while White gets a passer. 14.Јc2 c4. It transpires that White must act very energetically, or Black will just be a pawn up for nothing. And even a slow-witted kid can tell that I mean the c-pawn. 15.¦b1 Јa5 16.¤e5 Ґd6. Based on a fact that 16...¤xe5(?) is impossible due to 17.dxe5. However, it is possible – 17...Ґd7 18.exf6, and now: а) 18...gxf6 19.¤b6 with material advantage for White; б) 18...Ґxf6 19.Ґxf6 Ґxa4 20.Јd2 gxf6 21.e4 ўh8 22.exd5 Јxd5 (or 22...exd5 23.Јd4 Јd8 24.Ґd3!, forcing a transition into an endgame with heavy pieces) 23.Јc1, and White is not in danger of losing; в)18...Ґxa4! 19.fxe7 Ґxc2 20.exf8Ј+ ¦xf8 21.¦xc2 d4! 22.¦xc4 Јxg5 23.¦xd4 Јa5. Here Black has extra material, but it is difficult to convert it. In any case, the text-move is stronger. 18.Ґxc4! See the prediction after Black's 14th move. 18...¤e4! This move, making 4 white pieces loose, is stronger than 18...dxc4 19.¦xc4. Black's can't keep an extra piece by 19...Ґxh2+ 20.ўh1 Јd6 21.e4! while White develops the initiative. On 19...ўh8 White should also react 20.e4!, because after 20.Ґxf6 gxf6 (worse is 20...¤xf6 21.¤b6 Ґb7 22.¤a5 Јe7 23.¤xb7 Јxb7 24.¤xa8 Јxa8 25.¦b6 Ґe7 26.¦bc6) 21.¤e7 Јd8 22.Јe4 Ґb7 23.¦xb7 Ґxe7 Black keeps the advantage. After 20.e4! Ґxh2+ (20...h6 21.Ґd2 preparing Ґa5) 21.ўh1 Ґf4 22.¤e5 Јxc4 23.Јxc4 Ґxg5 Black gets more than enough wood for a queen, but White has a fantastic resource – 24.Јc6 ¦a7 25.¤xf7+! ¦xf7 26.¤c5!! (not 26.Јxc8+ ¦f8, andBlackconsolidates). For a moment Black has a rook and three minor pieces for a queen, but white pieces dominating in the center secure return of some of the material and further development of the initiative. 19.Ґxd5 (19.¤e7+ doesn'twork 19...Ґxe7 20.Ґxe7 ¤xc3 21.Ґd3 ¤b5) 19...¤xc3 20.¤xc3 exd5 21.¤xd5 Ґxh2+ 22.ўh1 Јd6 23.e4! In such positions it is important pretend that you have foreseen everything. Or, even better, it's still your preparation. 23...ўh8 24.¦b3. Loses 24.Ґe7 Јh6! Unperturbed Sasikiran keeps "increasing the pressure" (¦h3 is threatening), and Berkes finally slips. 24...¤f6? Correct was 24...Јg6!, attacking the opponent's bishop and planning to retreat on d6 with his own. On 25.f4 decides 25...f6 26.ўxh2 fxg5 27.¤c7 Јd6! Black returns an extra rook and begins a mating procedure: 28.¤xa8 Јxf4+ 29.ўg1 (29.¦g3 ¤f6; 29.g3 Јf1) 29...Јf1+ 30.ўh2 ¦f2 winning. 25.¤xf6. Also playable is 25.Ґxf6!? 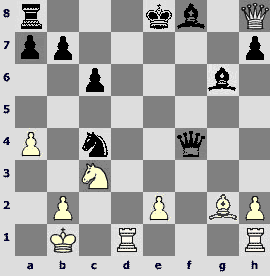 gxf6 26.¦b6, and White regains a bishop. After everything that happened in the game playing an exchange down would be like playing with odds. We have nothing to regret about – the text-move leads to a spectacular finish. 25...gxf6 26.e5! Ґxe5. After 26...fxe5 27.Ґe7? is suicidal once again – 27...Јh6 28.Ґxf8 Јh5! However, the idea actually used in the game, could be also applied here in a simply improbable way – 27.Јc5! Јxc5 28.Ґf6+ ўg8 29.ўxh2!! (unfortunately, there is a second solution 29.dxc5) 29...h5 30.dxc5. In the ending with extra exchange Black should not lose his optimism – he still has some drawing chances. 28.Јc5! An excellent blow, but we are still playing chess and not checkers, so Black escapes. White king is a bit misplaced. 28...Јd1+ (28...Јxc5?? 29.Ґf6+ ўg8 30.¦g3+) 29.ўh2 Јh5+ 30.ўg1. A last trap – 30.¦h3!? Ґxh3?? 31.Ґf6+ ўg8 32.¤e7#. However, Black captures another piece – 30...Јxg5 31.Јxf8+ Јg8, forcing a dull ending after 32.Јxg8+ ўxg8 33.¦g3+ ўf8 34.¤xe5. 30...Јd1+. Here30...Јxg5? 31.Јxf8+ Јg8 32.Јe7 transposes into a middlegame that is winning for White.